A TIME MACHINE IN THE HANDS OF A 12-YEAR-OLD! WHAT. COULD. POSSIBLY. GO. WRONG? In this second book in the "Youngtimer: Adventures In Time" Series, best friend's Carly and Patti are happy to have the summer off from school, and are determined to make the most of it. Carly's time machine is calling their names! 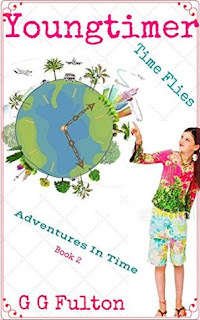 In between saving her "only" brother, Brad, from a difficult situation involving a 6'6", 275 pound linebacker, and a run in with the school drama queen, Carly and Patti are off on more great adventures as they carry out Carly's big plans: I Heart Grampa; Time Flies; Extra Extra Hunger; and De-Bully Lulu. Come along for the ride to non-stop fun and adventure. This is the second book in this series and it is just as enjoyable as the first. Carly, along with her best friend Patti set off on several adventures. This time things don’t go quite as smoothly. This series is really enjoyable. Adults and kids can both relate to the characters. They and their time travel are very believable. This is a series my students will definitely love to read. The adventure of time travel will be enough for some people. The idea of traveling back through time to witness parts of history make this even more worth the read. If you haven’t checked out this series yet then you had better get started, to see what you have been missing.